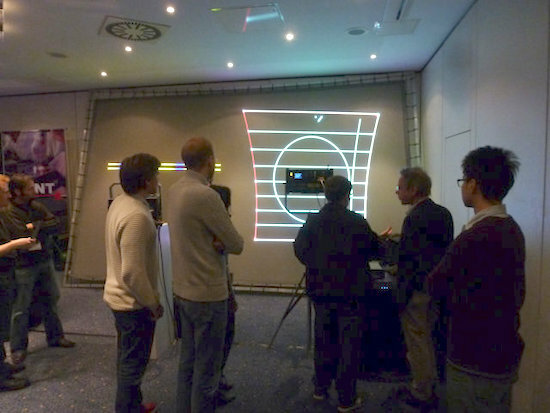 For 2013, ILDA's 25th Conference met in Aalen, Germany on 4-7 November, hosted by LOBO, producers of some of the largest and most complex laser shows in the world. LOBO also invited the laser show enthusiasts from the Laserfreak.net forum to hold their Laserfreak meeting 1 Nov - 3 Nov. This was a unique, first-ever opportunity for these two groups to mingle and share their knowledge. 7 Nov 2013: ILDA cultural day: Guided tour of the medieval Bavarian city Rothenburg ob der Tauber. A travel columnist's article about why he "fell in love with Rothenburg" is here. 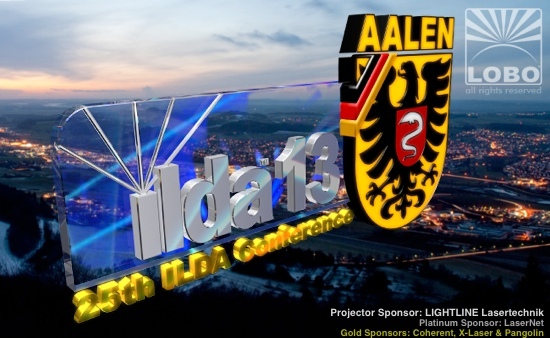 Both ILDA Members and non-members such as Laserfreaks can attend the ILDA Conference. (Registration costs are higher for non-members, and the ILDA Business Meeting is only open to Members.) There are some events such as the ILDA Awards, Lase-Off, and cultural tour which are also open to spouses and guests. Conference Registration information is below. The ILDA Trade Show on 4 November is open to any interested person; there is no charge to attend. If you are interested in exhibiting, there is a charge. 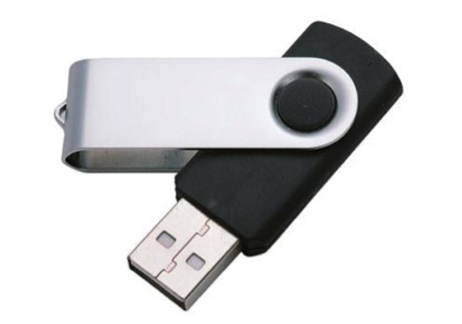 More information is maintained by LOBO on their ILDA Trade Show page. 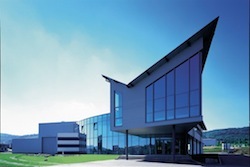 The Conference hotel is the 4-star Ramada Hotel Limes-Thermen Aalen. 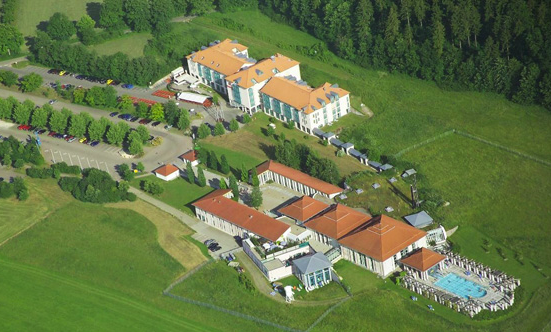 It is on the edge of the Swabian Alps and is directly linked to the famous Limes-Thermen mineral baths. There is more information about the several thermal pools and the clothing-free sauna at LOBO's ILDA Conference FAQ page. ILDA has reserved 30 out of the 146 sleeping rooms. Breakfast is included with the hotel room if booked through ILDA. We expect these rooms to go very fast, especially because the Laserfreak meeting will be in the same location. So you should reserve as early as possible to ensure staying in the Conference hotel. As of April 30 2013, we have been told that there are no rooms available for staying extra days after the conference, but if you want to stay over, please check with the hotel to see if a room has opened up. Other area hotels are available but will not have ILDA Conference rates, and won't offer same-building convenience. ILDA Member pricing is €79 (~$100) per night for a single, €94 (~$120) for a double. Internet WiFi access is €10 (~$13) per day. A taxi from the Aalen train station is about €10-12 (~$13-$16). Breakfast is included for ILDA Members. Aalen is in the center of south Germany. The closest international airport is Stuttgart Airport (STR) which is about 90 minutes away by train, or 70 minutes by car. Frankfurt Airport (FRA) is about 2.5 hours by train or car, and Munich Airport (MUC) is about 3.5 hours by train or 2 hours by car. From Stuttgart or Frankfurt we recommend taking the convenient railway. Train tickets can be booked in advance at DB Bahn; discounted rates apply on early bookings. Almost 2000 years ago, Aalen was the home of the largest Roman Empire cavalry north of the Alps. It was a sovereign free city-state from 1360 to 1803. Founded by Lothar Bopp, LOBO is active in 70 countries and is one of the top laser display companies. From manufacturing their own equipment, to producing world-class shows LOBO does it all with quality, receiving 139 ILDA Awards -- more than any other company. LOBO is also very active in ILDA; for example, Alex Hennig has served on ILDA's Board of Directors since Nov. 2010. Evening events such as the Welcome Reception, Lase-Off and ILDA Awards banquet will be held at LOBO's headquarters building, shown above. It is about 5 minutes from the hotel. LOBO has established a webpage for more information. Use the menu at the top of their page for more information about Aalen, the schedule, hotel, directions, sightseeing, and a FAQ. You can register for the Conference by visiting the ILDA Online Store. If you have any trouble registering, or if you have special requirements, contact ILDA directly and we will help. • ILDA Member Full Conference Registration includes all lunches and dinners, Welcome Reception, Lase-Off, Awards Banquet, General Business Meeting, seminars and workshops, tradeshow, and cultural tour. The ILDA Member registration fee is $545 through 31 July, $645 from 1 August through 15 October, and $790 starting 16 October. • Non-member Full Conference Registration includes all events listed immediately above except the General Business Meeting, which is only for Members. The non-Member registration fee is $795 through 31 July, $895 from 1 August through 15 October, and $1045 starting 16 October. • Spouse/Guest Registration includes all lunches and dinners, the Welcome Reception, the Lase-Off, the Awards Banquet and the cultural tour. It does NOT include the General Business Meeting, the seminars and workshops. (A spouse/guest is defined as someone staying in the room of a person who has registered for the full Conference.) The registration fee for a spouse/guest of a Member is $460. • Lase-Off/Laser Jockey, $225 as a single event. This includes the dinner beforehand. • Awards Banquet and Presentation, $225 as a single event. This includes the Awards Banquet dinner, plus the Awards Presentation event. Don't forget to make your reservations directly with the Conference hotel. Note: Event times are subject to change. A final schedule will be provided to all attendees when they register at the Conference. Photos depict events at previous ILDA Conferences. 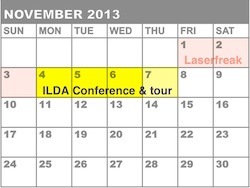 Not only ILDA Members, but also about 50-70 Laserfreaks are expected to attend. A floor plan of exhibitors, and information for companies that might want to exhibit, is on LOBO's ILDA Trade Show page. Receive a Certificate of Completion upon successful completion of the LSO course and a test. The LSO course is NOT included in Conference registration. The cost through 31 July is $560 for Members or $835 for non-Members. August 1 and later, pricing is $660 and $935 respectively. Note for Europeans: The material on laser safety is international; however, the course only covers U.S. regulations and notification requirements. ILDA General Business Meeting, part 1. Includes nominations, speeches and elections for Board of Directors. Must be a full registrant, spouse/guest registrant, or have purchased a Lase-Off/Laser Jockey/Buffet Dinner ticket for $225. Lase-Off: View laser shows from registrants. All are welcome to submit. Laser Jockey Performances and Judging: Anyone who wants to enter the 2013 ILDA Awards "Laser Jockey" category will perform live to music. Everyone in attendance will vote for their favorite. Election of President, discussion and voting on issues. Seminar on the efforts around the digital projector connection standard. Must be a full registrant, spouse/guest registrant, or purchased an ILDA Awards Banquet/Presentation ticket for $225. See 2013's top laser shows. 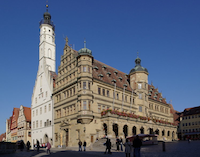 Join ILDA Members for a tour of the medieval Bavarian city of Rothenburg ob der Tauber. The town is located on a plateau above the Tauber River. Like Aalen, it was a Free Imperial City. The walled medieval city center is a tourist destination. It has been a location for several films, mostly fantasies, including Chitty Chitty Bang Bang, Harry Potter and the Deathly Hallows, and as inspiration for the town in Disney's Pinocchio. This was the best-attended ILDA Conference of the 21st century. Thank you to LOBO for their fine organizing, and co-scheduling of the LaserFreak conference, which helped make this possible. Fatih Eser, Effect Ses Isik Lazer ve Goruntu Sistemleri Ltd. Sti. Olga Eser, Effect Ses Isik Lazer ve Goruntu Sistemleri Ltd. Sti. Emre Kavsak, Effect Ses Isik Lazer ve Goruntu Sistemleri Ltd. Sti. Pavol Kubosek CSc., Kvant Ltd.
Mauro Comendulli, Laser Entertainment s.r.l. Lorenzo Pompei, Laser Entertainment s.r.l. Walt Meador, Laser Rentals, Inc.
Shunsuke Naoshima, Laser Show Ware, Inc.
Yoshihiro Sato, Laser Show Ware, Inc.
Robert Teorey, Lasertainment Productions International, Inc.
Mike Dunn, Lightwave International, Inc.
Wlodek Duval, Mediam Sp. z o.o. Cathleen Bastian, Pangolin Laser Systems, Inc.
William Benner, Pangolin Laser Systems, Inc.
Justin Perry, Pangolin Laser Systems, Inc.
Ante Uglesic, Pangolin Laser Systems, Inc.
Jim Martin, Peachtree Laser Inc.
Chris Stuart, Stuart Technologies Unltd. Phyllis Monahan, Lighting Systems Design, Inc.
Maja Uglesic, Pangolin Laser Systems, Inc.
Helen Martin, Peachtree Laser Inc.
Amy Kent, Stuart Technologies Unltd. 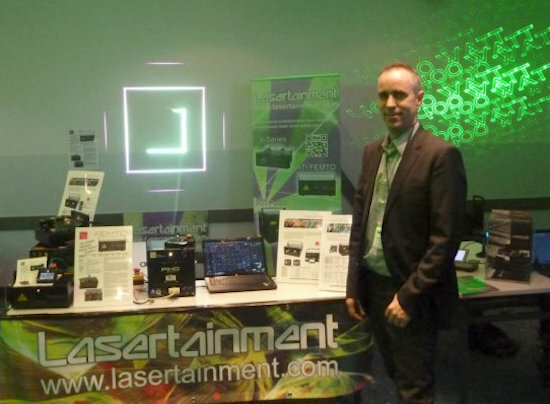 Helen Mehan, Laser Spectacles, Inc.
Niels van de Wijngaart, Laserimage B.V.
On Monday 4 November, prior to the actual Conference, ILDA held a tradeshow at the Ramada hotel. This was open to ILDA Members as well as persons who attended the Laserfreak meeting held November 1-3, also sponsored by LOBO. 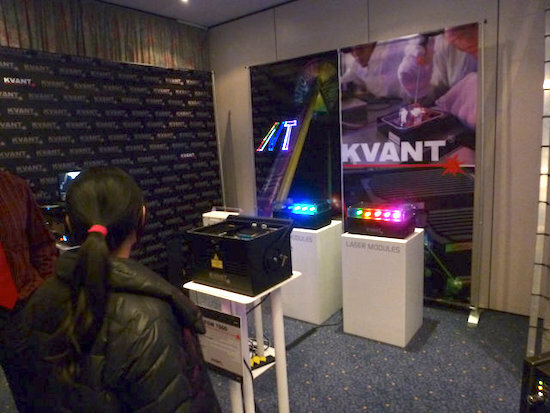 I first saw the Kvant booth, they had a big backdrop and a projector open for viewing. They passed out a nice new black catalog. LaserAnimation SOLLINGER was showing a new projector using fiber lasers - Derek Garbos was working on this with Michael Sollinger - it promised to be a new low low low divergence projector, best seen outdoors to appreciate. MT-Electronics was showing some cute little RGB projectors, I believe the LasPro system. 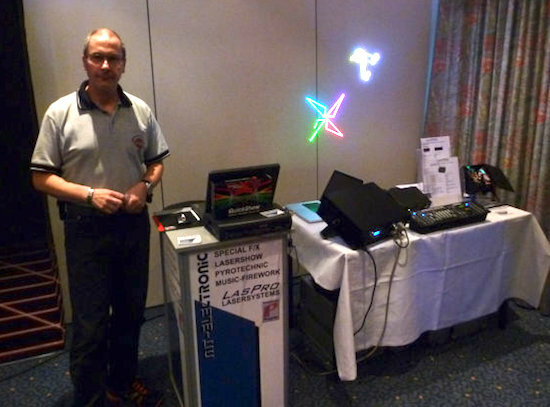 Lasertainment was showing nice projectors from RTI - "Femto" and "Piko". Robin Adams' booth was showing his new RayComposer software. He took me on a quick tour of his new drawing tools specifically for lasers, it was very impressive but hard to describe. They go way beyond the traditional drawing tools we've been using for years. Dirk Bauer and MediaLas had a good space packed with a variety of projectors, too much to take in at a glance! He provided a beautiful catalog for later viewing. 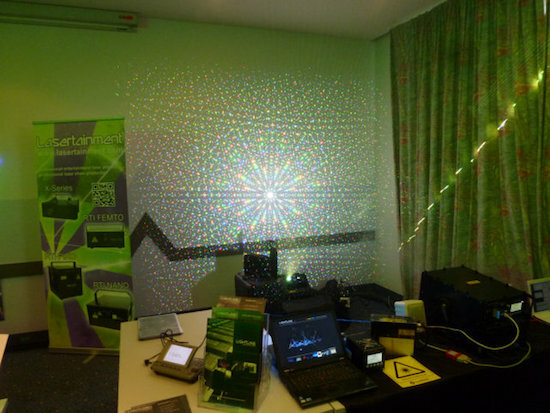 Lightline Lasertechnik had the most spectacular laser display over in their corner of the room - a bright OPSL beam going through their diffraction grating module! Showing their "Excellent" brand of projectors, Lightline added another twist for ILDA - Dirk Apitz had connected his new Ethernet (proposed standard) ILDA Digital Projector circuit boards between Lightline's Lasergraph DSP and the projectors, so that everything you saw projected was running through an extra layer of digital I/O. This was to help beta test this new product. 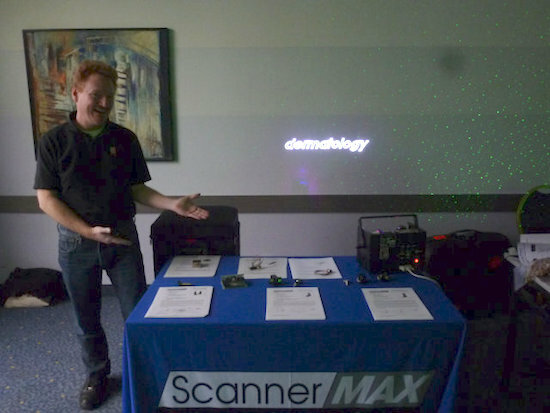 Bill Benner was manning the ScannerMax booth, showing images and had the complete line of the new scanners lined up for examination and discussion. 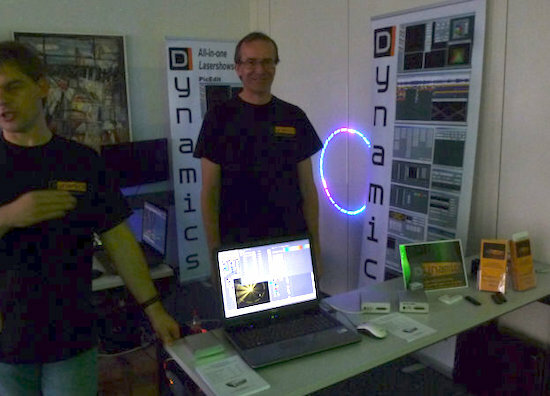 Joachim Mueller's booth had the full line of his EasyLase and NetLase ILDA output modules on hand, as well as some new software to show off - "Dynamics" - providing timeline, picture editing, and live control, and "C4Dynamics" - Cinema 4D converter. 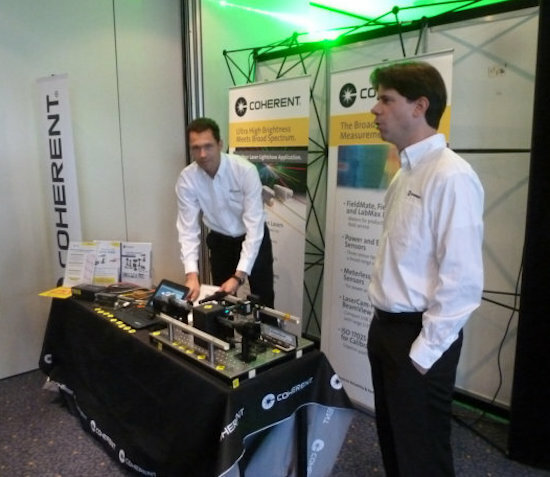 Coherent had a nice booth with an OBIS laser in it, software demonstrating its superior beam quality, and two reps to handle any questions. 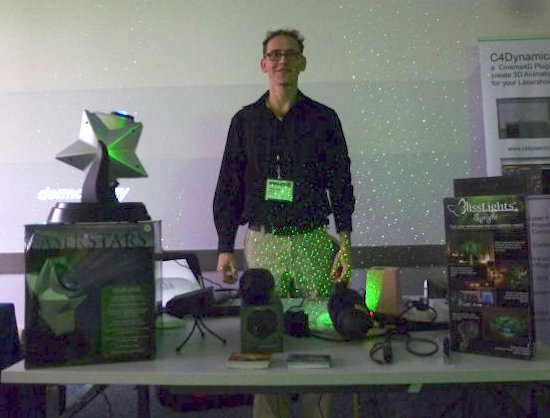 The NewAje booth featured diffraction grating projectors at different price points - Laserstars and Blisslights, as well as fun and quirky laser pointer items. The 2013 ILDA Conference was held 4-7 November, hosted by LOBO. This page summarizes some of the events. 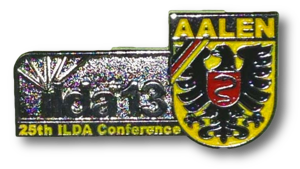 Every person registered for the Conference received a commemorative ILDA 13/Aalen pin, and a USB drive containing videos of every ILDA Award-winning lasershow (1st, 2nd, and 3rd places each, in 15 categories). The Conference officially began with the ILDA Business Meeting on 5 November. There were two candidates for the two Board of Directors seats that were up for election. Since there was no need to hold a vote, the two candidates were elected by acclamation. Congratulations to Dan Goldsmith of X-Laser (re-elected) and Francesco van Loon of Collimated (elected to the seat previously held by Justin Perry). These two join the other three Directors: Christine Jenkin, Olga Eser, and Alex Hennig. Incidentally, this appears to be the first Board where the majority of Directors are from outside the U.S. (Francesco, Olga and Alex). On the second day of the Business Meeting, on 6 November, just one of the Board members chose to run for President. This meant that Christine Jenkin was elected by acclamation for another term as ILDA President — congratulations! The attendees then heard about proposals for the 2014 ILDA Conference. This had originally been scheduled for New York City, hosted by Robert Teorey, but we could not find reasonably-priced facilities in the city. Prior to the conference, ILDA had tentatively moved the 2016 Conference in Baltimore to 2014. Both X-Laser and Image Engineering very generously offered to host in 2014. 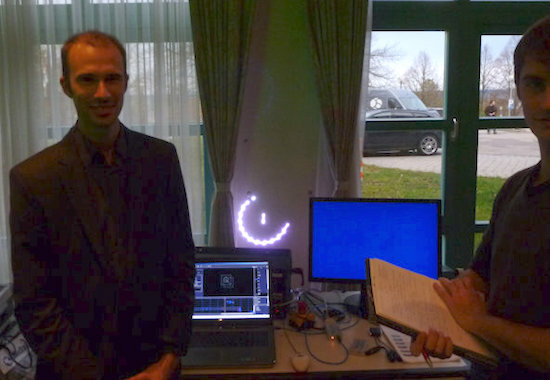 But during the Aalen meeting there was a new proposal for Las Vegas in 2014, co-hosted by Robert Teorey and Tom Harman (LaserNet), both of whom have shows running in Las Vegas. The attendees voted for this plan, which keeps the 2016 Conference in Baltimore (and gives Image Engineering some well-deserved breathing room to plan!). After the planned agenda was presented, the floor was opened to new business. EU Regulatory committee and "Kid Krypton"
So Peter then proposed forming an EU Regulatory committee. This passed, with Peter agreeing to be chair. The first two members who volunteered were Markus Steblei and Richard Schäfer. Tom Harman gave a presentation about “Kid Krypton”. This was a show he had created to get children interested in laser light. His goal was to get assistance with turning the storyboard and soundtrack already prepared, into a finished show. There was no other new ILDA association business, so the Conference then went on to the various daytime seminars and nighttime events. The following presentations were given during the ATW, organized and chaired by Dirk Apitz. For more information, click to download the ATW agenda. • Integrated laser show controller. Michal Pokluda, Showtacle Ltd. The main part of the Conference ended on 6 November with the ILDA Awards banquet and presentation. Dirk Baur was the Master of Ceremonies for the presentation. A complete list of all 2013 ILDA Award winners is here. The following is from an ILDA List email message sent by Tim Walsh, ILDA Awards Committee chair, on Nov. 20. Thank you to all of the participants in the ILDA LaseOff and Awards production! 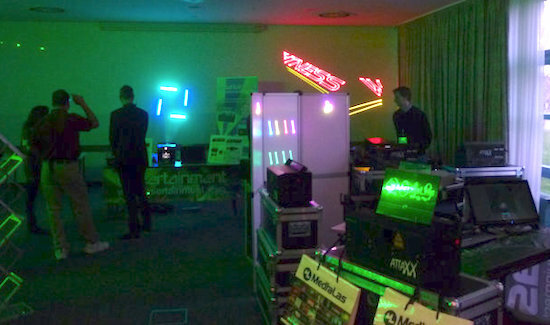 Special thanks go to Horacio Pugliese of LaserNet, and Marco Stümpel from Lightline Lasertechnik. Horacio not only designed and built a very elegant 6-channel ILDA ISP switcher, but worked tirelessly all day on Nov. 5 to connect the five different computer systems into the system and make sure that all was working correctly. Marco and Lightline sponsored, brought, and set up all of the laser projectors used in our events (9 projectors were set up), and Marco was right by Horacio's side all day making everything happen correctly. • LOBO's staff, standing by all day and responding to all of our requests with good humor and efficiency. • Greg Makhov, who brought his irradiance meter, stood by most of the day, and checked the safety of the beams when each new computer was added into the setup. • Bill Benner, who was on hand all day to assist Pangolin users participating in the LaseOff. • Dirk Baur, who stepped up, put on his tuxedo, and was our Master of Ceremonies for the Awards ceremony. Thanks also to those members who provided programming and performances at the LaseOff; this involved a lot of waiting for a turn at the computers and everyone was patient and cooperative. Best regards to all and hope to see you next year in Las Vegas!